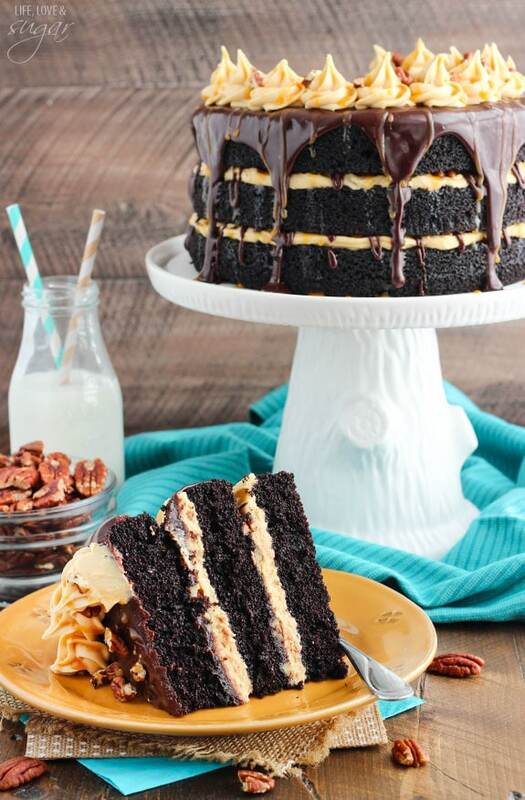 This Turtle Chocolate Layer Cake is a super moist chocolate cake filled with caramel icing, pecans and chocolate ganache. It’s delicious and the perfect celebration cake! Today I’m celebrating the life of a blogging friend, Joan from Chocolate, Chocolate and More, who was taken from this world much too soon just last week. It also just happens to be National Chocolate Day, which is a fitting day for a woman who loved chocolate as much as Joan. I’ve said it before and I’ll say it again. 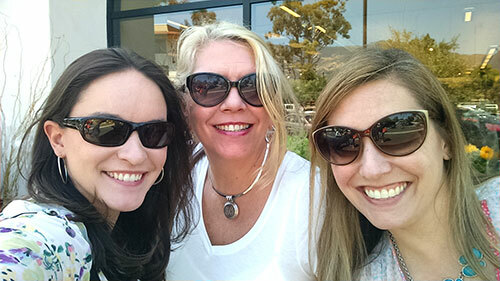 One of my favorite parts about blogging is the wonderful other bloggers I’ve met and become friends with. There is so much that goes on behind the scenes of a blog and having the support of others who understand it and become friends is a blessing. Joan is one of the wonderful bloggers I had the pleasure of meeting and becoming friend with over the last few years. She lived just 2 hours away from me, with Atlanta right in the middle. The first time I met her was for lunch with another blogger and it was immediately apparent the kind of presence she had. With a much more popular blog than my own, she was humble, super friendly and fun, and always willing to be as helpful as possible. Of course when she left, she got several pieces of cheesecake (we were at The Cheesecake Factory) to take home to her family so they could all try them. I knew right then she was my kind of woman and we were destined to be friends. Those are but a few small memories of a tremendous person with a big love for sweets, life and her family. Joan also had an incredible business mind. I admired her so much for it and really appreciated her advice and help. If there was anyone I wanted to learn more from from a business stand point, it was Joan. Next week I will be attending a food blogging conference in Chicago. Joan and I had booked our flights together and I was so looking forward to the trip. I won’t lie, that flight next week is going to be awful without her. More than anything I feel terrible for her three kids that she leaves behind. I can’t even imagine losing a parent at a young age. While we don’t yet know what Joan’s final wishes were, I remember her talking about her kids and her wishes for them with her blog. I thank the Lord that she had already put plans into place for them if anything ever happened to her. See why I admired her so? Thanks so much for letting me take the time to remember a good friend. Though her loss has been difficult for many, I keep picturing her in Heaven, praising Jesus. While I don’t know what Heaven will actually be like, if I had to guess, I’d imagine it would involve chocolate for Joan. UPDATE 9/7/16: Here is a video showing the process of making the caramel sauce and the frosting, since some people have had trouble with it. I show the frosting being piped at the end so you can get an idea of the consistency. This particular batch of frosting was still a bit warm when it was piped, so it firmed up even more as it cooled. 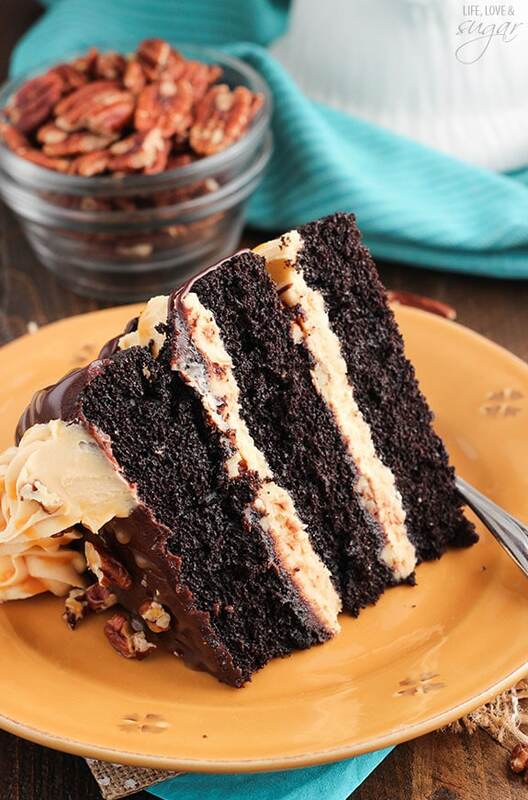 Turtle Chocolate Layer Cake is a moist chocolate cake filled with caramel icing, pecans & chocolate ganache. It’s delicious & the perfect celebration cake! 7. Pour sugar into an even layer in a large saucepan. 8. Heat on medium-high heat, whisking the sugar until melted. The sugar will clump up first, but will eventually completely melt. This will take about 10 minutes. 9. Once the sugar has melted, stop whisking and allow to cook until the sugar has turned to a little darker amber color. You may notice a nutty aroma. The change in color will happen quickly, so don’t let it go too long or get too dark or it’ll burn. Remove caramel from the heat. 10. Add butter and whisk until combined. The mixture will bubble up, but keep whisking until all the butter has melted and combined. 11. Slowly pour the heavy cream into the caramel and whisk until incorporated. 12. Cool for about 10-15 minutes before using. 13. Set aside about 1/3 cup of caramel sauce, then transfer remaining caramel sauce to a mixing bowl. 14. Slowly add powdered sugar and milk and mix until smooth. You can add more or less milk to get the right consistency for the icing. For help with getting the right consistency, check out this post. 15. Make the ganache by adding the chocolate chips to a metal or glass bowl. 16. Microwave the heavy whipping cream until boiling, then pour over the chocolate chips. Cover bowl with clear wrap for about 5 minutes. 17. Whisk chocolate until smooth. Microwave in 5-10 second increments as needed, if chocolate isn’t fully smooth and melted. 18. When the cakes are cool, remove the tops of the cakes with a large serrated knife so they are flat. 16. Place the first layer of cake on cake stand. Top with 1 cup of the caramel icing and spread into an even layer. Top icing with about 1/4 cup of chopped pecans, then drizzle with some chocolate ganache and caramel sauce. 17. 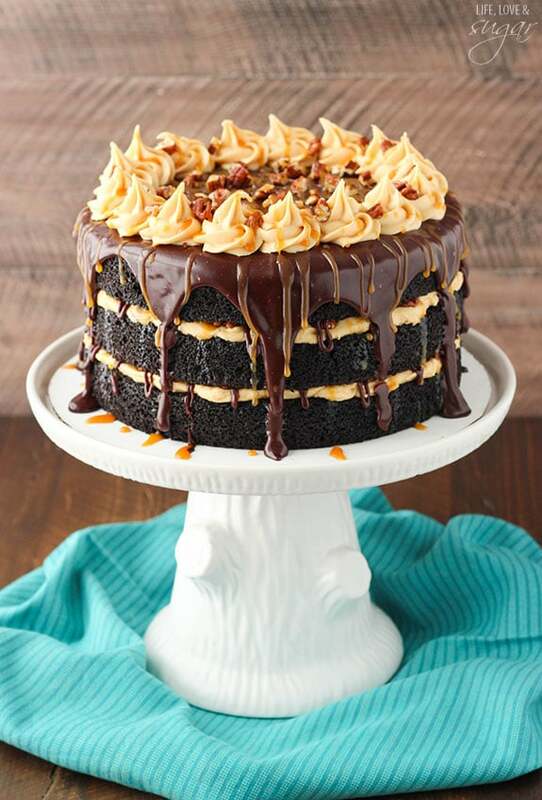 Add second layer of cake and icing and add another 1/4 cup of chopped pecans, caramel sauce and chocolate ganache. 19. Pour remaining ganache over the cake and allow it to drizzle down the sides of the cake. Refrigerate until the ganache is firm. 20. There should have been a little caramel icing left. Use that to pipe caramel icing around the top edges of the cake, then sprinkle with remaining chopped pecans and drizzle with caramel sauce. I’m so sorry for your loss. You knew Joan personally, and while I never had the chance to meet her, I have heard so many wonderful stories about her. I loved her blog, and my heart goes out to all her friends and family right now. This cake is a beautiful way to show your love for all she did. I’m sure Joan would think it was incredible. I am eager to make this cake but noticed it calls for 2 cups of flour and 2 cups of sugar yet the grams are different. It didn’t sound consistent. Please let me know if there was a typo before I make this cake. My mouth is watering just looking at it and know it will make a beautiful impression on my girlfriends when we get together. I read you had a loss, I am so sorry. My husband just died 4 months ago and it seems like yesterday. Reading the remarks, Joan sounds like she had a great following and I am sorry I missed her blog. The grams are different because the cups measure volume and the grams measure weight. Sugar and flour weigh differently, so it is all correct. Thanks Judi! What a beautiful cake. A perfect tribute to our dear friend. I’m so sorry for your loss. This beautiful cake and this lovely post is such a heartwarming tribute to your friend. So many great memories! I’m very sorry for your loss and I hope you can enjoy your trip without her because you know that is what she would’ve wanted you to do! And Joan would’ve loved this cake! Big hug to you Lindsay! I can’t wait to see you next week here in Chicago. Looks like we’ll be having nice weather too 🙂 Joan would have loved this cake! Although I am VERY knew to the blogging world, have already felt the love, respect and family feel this group has. So appreciative to have discovered this book of the internet. Blessed to have followed Joan since only March, and enjoyed her recipes, more importantly the smile.Went thru a series of rough times since March. My new “family”has inspired me in the kitchen and the outpouring of love towards Joan and her family has inspired me in my heart. God bless all and comfort you all at this time. Treasure how fortunate you were to know such a huge presence We will miss her,but we will keep that presence alive through her recipes. Made a board on Pinterest. The best of “chocolate”.For Joan. HUGS!!! I don’t know what I would do without you. I am so happy you could be there for Joan’a family. I need next Thursday to be here. BIG hugs to you, Lindsay! What a fantastic tribute to Joan and a gorgeous looking cake that I know she would have loved. Thank you for sharing your friendship with us. The flight and the conference will not be easy, but I’m so very glad that you will all be there to give each other hugs and comfort. 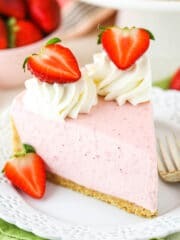 Can I pre make this? Will the ganache make the cake too soggy if make 2 days ahead? Just curious how the consistency changes once cooled to room temperature. Yes, you can pre-make it. The ganache is fairly firm. 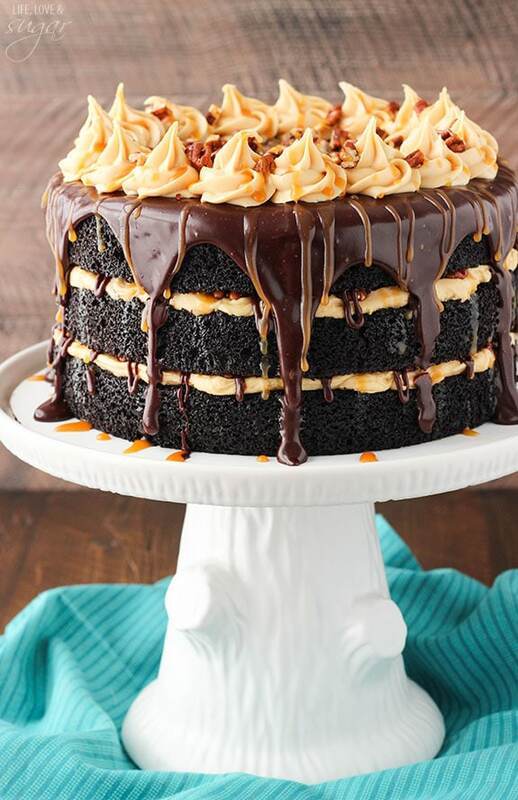 You can cut through it, but it definitely shouldn’t make the cake soggy. Just keep it well covered and refrigerated, then set it out to com to room temperature up a bit before serving. I just finished making everything and am ready to put my cakes together but my icing is still thin. I added the 4 cups of powdered sugar but idk how much more I should add and at what point will be too much. Do you have any tips? It seems strange that it would be too thin. It’s usually a pretty thick icing. Did you let the caramel cool a bit? It could be that it hasn’t thickened much yet. My caramel also doesn’t look anything like yours! Yours looks like s fluffy icing and mine just looks like melted caramel. I even added 4 extra cups of powdered sugar! That sounds very strange. Perhaps too much cream was added to the caramel to make it too thin? I re-made the caramel to make sure and if anything I had to be careful that it wasn’t too thick. This would be so delicious with a heathbar broken on top of it ,love your receipt!!! Great looking cake and a lovely way to cerebrate your friendship with Joan. 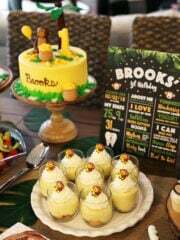 I’m thinking about making this for my nephews birthday but he’s not crazy about pecans or nuts in general. Do you have any tips what I can substitute them for? I’m thinking some kind of chopped chocolate bar but I’m not sure if that will make it too sweet or clash with the cake. You could definitely just leave the pecans off if you want. You could also try to find some caramel filled chocolates or candy (like milky ways!) and chop them up. I live in CANADA, so when I went to find The Hershey’s special dark chocolate Cocoa I found out it probably isn’tavailable here. Any suggestions for a substitute? Regular cocoa would be fine. They sell the Hersey’s cocoa at Safeway, They do in Alberta anyways. I’m giving this a whirl this weekend! I can’t wait. Would i need to change anything (bale time) living in a higher climate? Hi Christine, I’m not really sure if you’d need to change anything based on the climate, I’m sorry. I hope you enjoy it! I’m so sorry about your friend. My condolences to all that miss her! I wonder, where could I find the tree stump cake stand you used in your pictures here? I got this cake stand at Home Goods. I am going to make this cake for my daughter. I am in Australia and I can’t seem to find heavy whipping cream. What can I use alternatively? Can I use double cream instead? Waiting for your reply. I’m not familiar with double cream, but my guess is it’d be fine. 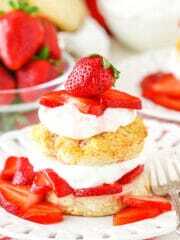 Hello, tranks for this perfect recipe. I like so much, the cake is so rich and the chocolat flavour is really intense but not overwhelming. This looks so good!!! Does the caramel sauce have white sugar or brown sugar in it? Thank you for sharing the recipe. Hi, so I plan on making this cake for my grandmas 80th birthday it looks amazing! So I thought I’d do a test run before and the caramel icing wouldn’t thicken up- I added heavy whipping cream and powdered sugar and it still wouldn’t, so when I put the cake together it ended up being a runny mess. I was hoping maybe you had some tips when it comes to the icing. I’m sorry I wasn’t able to respond sooner. Were you able to get the caramel to work? It should thicken as it cools. When you say ‘flour’ in the recipe for the chocolate cake, are you referring to ‘all-purpose flour’ or ‘self-rising flour’? That cake is sooooo ME! May i ask you please, when you say for caramel “heavy whipping cream, room temperature”, that will be like milk or have to beat it like yogurt for example? Heavy whipping cream is a specific kind of cream. It has a much higher fat content than milk. LaRee – The same thing happened to me. The icing is way too thin. Not fluffy as the photo depicts. There is no way I could pipe it. Not sure what to add to thicken it. I feel it needs something other than more powdered sugar. Everything else is ready to go. Help! The cake looks amazing but I adore the cake stand. It’s darling. Do you mind me asking where it is from? I got it at home goods. Do you think the cake could be baked In a bundt pan instead of layers? I’m not sure since I haven’t tried it. Hi Sara, I’m sorry you had trouble with the caramel. I can’t even count how many times I’ve made it so I know it works very well. If it hardened when you added the butter, odds are the butter wasn’t room temperature. It’s very important that both the butter and heavy cream are room temperature or warmer, or it will ruin the caramel. I had the same problem. Twice. Both times, the heavy cream and butter were at room temperature. Turned into little rocks. If your room is somewhat cool, you’re butter and cream could still be too cool. Warm them up, if needed. You can even melt the butter to know that it’s not at all cool. It is a temperature issue. Honestly what is powdered sugar? It’s also called icing sugar and confectioners sugar. It’s a more powdery sugar for frosting and icings. Is there 1 cup of icing in between each layer? Hello! I was just wondering how money cups of frosting you Carmel frosting makes that you use on your turtle chocolate cake. I believe it was a little over 2 cups. I don’t think it’s bitter. I understand your fear – I generally prefer milk chocolate in candy. But I love the strong chocolate flavor of dark chocolate in baked goods. Can I replace something else instead of eggs please !!! ???????????? I don’t have experience replacing eggs in cakes, so I’m not sure what to suggest. I’m sorry. Hi! I don’t think it would be a problem but I only have 9 in pans. I would just have to adjust the baking time a little bit correct? This cake is just awesome! I made one this past Saturday and every scrap was gone. So I made 2 on Sunday and just about all of that is also gone! 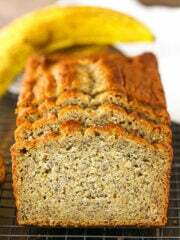 I will definitely be making this again and again – thanks so much for the recipe! Awesome! 🙂 I’m glad it was such a hit! Thanks Tana! This even impressed my culinary school sister and she never compliments me on my food! I suspect anyone having trouble with the caramel frosting not getting thick enough didn’t cook the caramel long enough. It actually has to get pretty dark in order to thicken the caramel base for the frosting. There is probably a temperature from a candy making recipe that might help people. I’m so glad you enjoyed the cake! 🙂 You are right that the caramel gets fairly dark before you add the butter. A temperature would certainly help. I’ll have to measure that next time I make the caramel. Thanks Heather! Just use a cup of cold water and drop a small amount of syrup in it.if it makes a “soft ball ” then it is ready for the butter and cream . Hi there, I just had a question about the caramel icing. Do you whip the cream at all or use a spoon to mix? My icing is darker in colour than your photos and is quite runny. I also think I may have used the wrong type of cream, I used thickened cream (Australia) and tried twice making the caramel darker the second time but same result. Also when you cool the caramel before the icing sugar. After 10-15 it’s still warm. Should I wait till completely cool or just the 15 min? Love the recipe and I look forward to trying it again 🙂 It was a hit even with runny icing! Sorry I just re read my comment and it’s a bit confusing. So I used a hand whisk to incorporate the butter and cream into the caramel then a spoon to mix in the icing sugar after 15 mins. I don’t whip the cream, just add it as is. The caramel is actually quite thin until it cools. 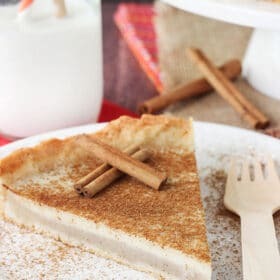 The caramel would actually completely harden without the cream and butter, so if it doesn’t firm up you may have added too much cream and thinned it out too much? I’m not familiar with thickened cream, but heavy cream is definitely on the thicker side as far as milk/cream goes. It’s fine if the caramel is still a little warm when you add the powdered sugar. I usually put the caramel into the mixer bowl to cool, then add the powdered sugar which thickens it right up. I used double cream (Australia) for the icing and it worked great. Still darker and not as creamy looking as yours but pipe-able and delicious! What a beautiful tribute and cake! Thank you for sharing, my birthday is the 28th and this is going to be my birthday cake. This is a follow up…despite the appearance of my cake (we jokingly called it a lava cake), this was one of the moistest, most delicious cakes that I have ever made! I am really still puzzled on what I did wrong. I waited close to four hours before putting on icing, yet it still melted. I look forward to comments!!! Hello, i’m a 15 year old from South Africa and i enjoyed making your cake for my final practical exams for Culinary classes that i do at school. My examiners really enjoyed it, especially the caramel sauce. it was my second time making it and it turned out just great. Hi! I made the cake and it tasted fab! However, the colour was more dark brown than black, as in the photo. I used regular hershey’s cocoa powder since that’s what available in my city. How do you think I can make it black? food colouring? which one? The cocoa powder is definitely what the difference in color was from. The dark cocoa gives it that almost black color. You could order it online. If you want to use coloring, I’d suggest and icing gel color – it’s thicker and stronger so you won’t need as much to get the batter black. 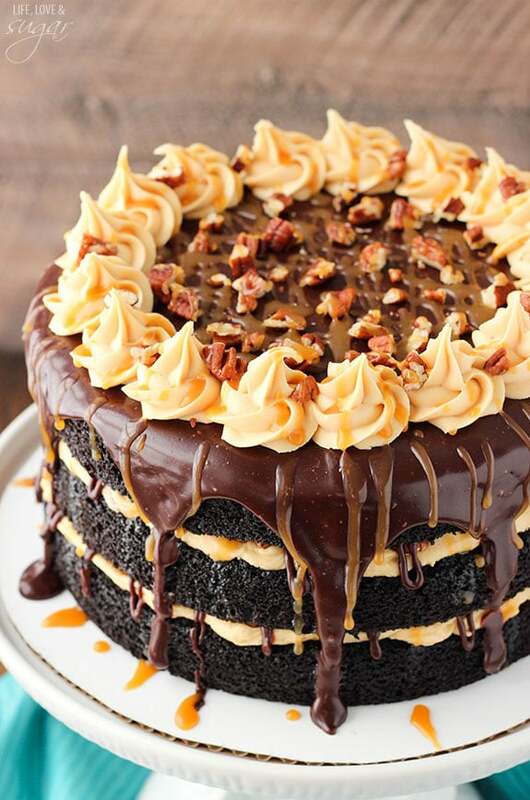 I am in the middle of making this cake and I just had to post that the caramel in this recipe is very frustrating. I am not new to homemade caramel and didn’t use the recipe I normally use and went with the one in this recipe, disappointed. I have made two batches and both are going in the trash. I am now having to dig out another recipe that I know will work. I’m sure the cake will be delicious. I’m sorry you had trouble with the caramel. I’ve made it more times than I can count so I do know it works. If you describe the problem you had, I’d be happy to try to help trouble shoot. 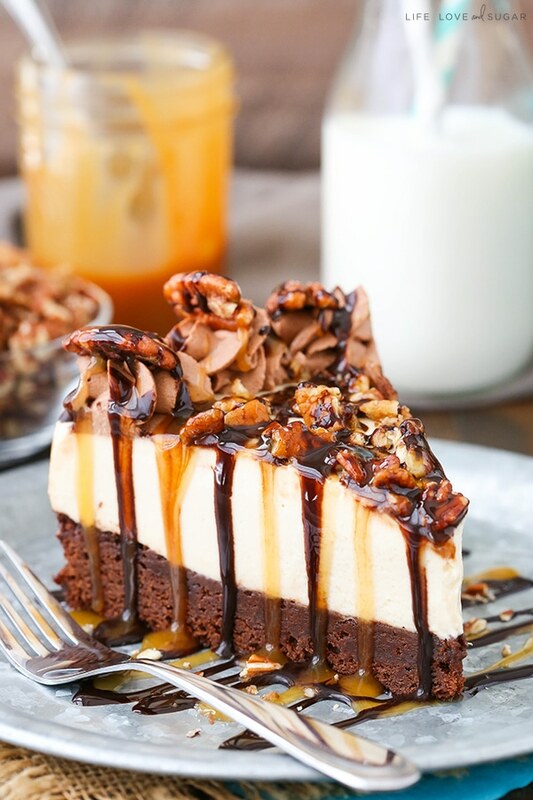 If seizing was an issue, then just be very sure your butter and heavy cream are at room temperature or warmer – the caramel is very sensitive to cool ingredients and will seize easily. I hope you were able to find a solution and enjoy the cake! I just made this cake and the Carmel icing was a disaster as many others have commented. I followed and measured exactly as written. The only thing I can figure is that I didn’t let the caramel cook long enough. It was dark amber. Have you been able to identify what is going wrong? I’m very sorry you had trouble. There isn’t actually anything wrong with the recipe – I do know it works as I’ve used it many, many times. It’d be hard for me to say what is going wrong for people – I imagine it could be different for everyone. However, since people are having trouble I’m trying to get a video of myself making it together so that people can at least see how it’s supposed to look/work. Curious if you were ever able to make a video of you making the caramel icing. It is one of my favorite cakes based on taste, but the presentation is horrible when you don’t get the icing right. Would really like to try it again after watching you do it. Two questions, first…does this cake need to be refrigerated? And second…how deep were your 8″ pans? You could probably go either way on refrigeration. If it won’t be out for longer than a day, it’d probably be ok at room temp. I believe I refrigerated it though since there’s quite a bit of moisture. I do recommend serving at room temperature though. My 8 inch pans are 2 inches deep. Is the caramel sauce usually thin when you first make the caramel? Yes, it’ll be quit thin at first and thicken as it cools. You can see in the photos in this post how thick it ends up. 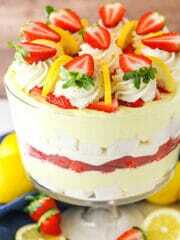 Please explain how do you assemble the cake? I don’t want to make any mistakes. What is the order of frosting the cake? Thank you in advance. The frosting turned out very thin, so the cake was slipping around. There’s no way it would have been able to be piped! It still tastes delicious, but was a bit of a mess. I find caramel also turns out better when the sugar is melted over a medium heat or lower. It’s far too easy to burn if you go med-high. My caramel came out great, but just made the icing, and there is no way it can be piped. It is very runny. I added 4 cups of powdered sugar and 2 Tbsp of heavy cream to the caramel sauce. Not sure what to do. Made this for my husband and it was amazing! I don’t like dark chocolate, and I think that I ate most of it! I have to keep this cake in the fridge overnight as I am making it a day ahead. How would you suggest storing a naked cake to ensure it stays moist? I have some large cake carriers that I use. They work very well. This one is a favorite – you can remove the cupcake inserts and it’s nice and tall inside. Okay! My mom and I made this cake and we had a lot of problems. First off: the ganache was runny. I left it in the fridge for two nights before assembling the cake and it still wouldn’t harden on my cake like your’s. Secondly: My mom and I had to make the caramel TWICE because it was full of clumps and hardened on us very quickly. 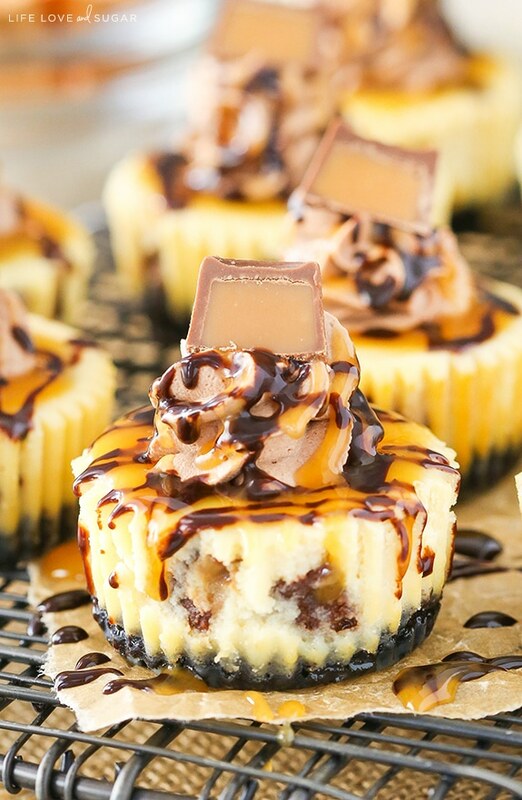 So, my advice is just buy caramel and add it to the frosting, and just drizzle it over the layers. Don’t attempt this caramel recipe. We aren’t beginner bakers, but for some reason this recipe just wasn’t working for us. I want to make this cake but cannot seem to find a way to format it so I can print it out and read it like a recipe. Is there a trick to using your website? No tricks involved. 🙂 If you look at the recipe, there’s a small photo next to the ingredients. Just under the photo is a teal print button (assuming you’re on a desktop computer). If you’re on mobile, there’s a button just above the ingredients. The cake looks amazing!! Really enjoy your blog :). A question: can I make the caramel in advance, keep it in fridge (or should I keep it at room temperature?) overnight and add the icing sugar & milk the next day? Yes, that would work just fine! It can definitely be refrigerated. Love this cake , I was thnking about christmas, and it´s coming! 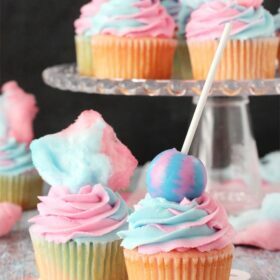 so i wanted to do chocolate cupcakes ,but i just found that this is the kind of cupcake that I want, what might happen if I transform this cake recipe into a cupcake recipe? is it fine? would they remain just like this cake? You could definitely turn this into cupcakes – I’ve made chocolate cupcakes with this cake recipe here. 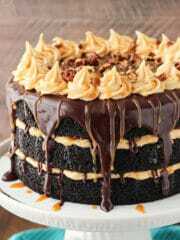 The caramel frosting should be great on top, then you could drizzle some chocolate over the top and sprinkle some chopped pecans on top. 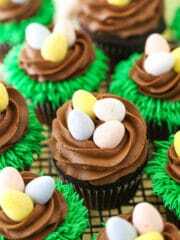 Another option is to try these Turtle Chocolate Cupcakes. 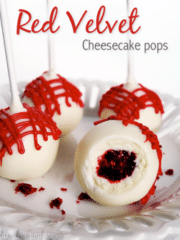 They are made a little differently but are SO good! The cake disappeared very quickly, with demands for a second cake soon! Definitely worth a second attempt! Thanks Lindsay and all for useful tips. Yay! So glad you’re happy with the caramel and the cake! I’m glad the tutorials were helpful! Made the recipe as stated.. even watched the video on the caramel.. cake average in taste.. caramel recipe is a mess and hardened to a rock in my pan… do not suggest this unless you want to buy a new pot..
Hi Krista, I’m sorry you had trouble with the recipe. The reason it hardened into a rock is because either your butter or cream were too cold. The melted sugar is very sensitive to cold and immediately hardens. I believe your cake looks and tastes awesome. I am currently making the frosting but it is not as smooth as a buttercream, I can feel and see the powdered sugar in it. What should I do? Hmmm sounds like your powdered sugar is a little firm and has gotten some firm balls in it. That can happen if powdered sugar is stored for a while and maybe exposed to humidity. To avoid it in the future, I’d suggest sifting the powdered sugar. That’ll get rid of lumps before adding to the frosting. I hope that helps! I’m wanting to know what your suggestion would be if I made this in a 13×9. How drastic would I need to reduce the cake and icing ingredients. I’m thinking of doing it as a cake layer, ganache, frosting then pecans. What are your thoughts on that as well? The cake itself wouldn’t change, you’d just need to adjust the baking time. I’m not sure exactly what it’d be. Probably between 30-45 minutes. I’d probably leave the frosting and ganache the same. The ganache will probably soak into the cake a bit if you pour it over the cake while it’s still warm (the ganache). You could reduce that a bit if you don’t want a heavy ganache layer. Maybe cut it by 1/3 or 1/2. The frosting will likely be just enough. Hello! I really want to make this cake for my 18th birthday (31 Dec), and I want to know whether I can half the recipe? Or will it then be a total flop? Hai lindsay.. just to double confirm.. this recipe doesn’t use creaming method? Thank you for sharing this recipe, Lindsay. I just finished making this cake and it looks amazing! I’m taking it to a party tonight and I can’t wait to taste it. I can send a photo if you want! Just got home from the party and the cake was a hit…it’s all gone. I will definitely be making this again! This cake was delicious. And the caramel sauce was easy. Tip: after sitting on the counter in the sun for a couple of hours, to ensure the cream and butter were at room temperature (I made this in March when my home is always on the colder side, so its hard for ingredients to reach a realistic room temperature), I placed them in the oven for a just few minutes after I removed the cake. The sauce was perfect! My guests devoured this cake. It was time-consuming to prepare but definitely worth the effort. 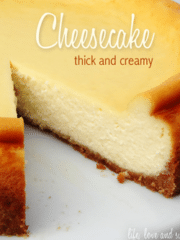 The temperature of the cream and butter are definitely key! Glad to hear you enjoyed it, Karen! 🙂 Thanks! I made this tonight . Looks beautiful and tastes great. However I did have trouble with caramel sauce? I did as directed, could I have pored the cream in tonmuch at at time? I had a big clump of hard caramel ? I poured it in little by little bit maybe not slowly enough. I got it fixed , but it was a pain? Any suggestions? And it took forever for the sugar to melt at least 15 minutes ? Help. If it clumped, it’s most likely because the cream was still a little cool. Try heating it up first so you know it’s not cool at all. i made this cake and it was fabulous. I made it for my sis n law bday party and she loved it. This cake go so many compliments. After the first slice was cut, 3/4 of the cake was gone in 5 minutes. it spread like wildfire thru the party that this cake was great and tasty! For all those having trouble with the frosting…a few pointers if i may…The more liquid you add when making the frosting the thinner it becomes. Start off with a tsp of milk at a time, this lets you watch the consistency you want. To make the swirls on top, take about 1/3 cup of the frosting out when it is at its thickest (the swirls wont hold shape if frosting is too thin). Then continue to to add more liquid to thin out the frosting to icing between layers (but not too thin). I did not use all of the milk listed above. I didn’t count the tsp used since I make frosting all the time and just know the consistency i like between the frosting I use for decorating details and the frosting used for icing the cake. Hi lindsay the cake looks fabulous.I tried the recipe the caramel sauce was perfect but the icing was too thin.I cooled it for 15 minutes but it was still hot.do iyou have to wait until it totallly cooled to make the icing?and for the caramel sauce I have to let it cook a bit or just when the butter isand totally melt?because I got the dark brown color immediately. Thank u in advance ???? I have a new post on frosting consistency that you might find helpful. If you’re having trouble with the caramel frosting, I’d let it cool completely so that you know for sure what the consistency is like, then make the frosting. I am going to make this tonight for a easter lunch tomorrow, and I was wondering do you store this in the fridge or is it OK to be stored on the counter until tomorrow? I’m afraid if refrigerate it overnight then it will dry out, thoughtso? I’d probably refrigerate it, just so it doesn’t get too soft. Do you have a cake carrier to store it in so it’s well covered? That’ll help keep it from drying out. I do! Thank you, can’t wait to try it out! Just a update, the cake turned out excellent. I know others had trouble with the Carmel and thickening of the frosting but I followed everything to a tee (including making sure everything was room temp and that my Carmel was completely cooled before making frosting) and it turned out perfect! Thank you! I’m so glad it turned out well! Thanks Ashlee! Making cake as we speak for my husbands 50 th. I was wondering if can l make the frosting ahead and decorate tomorrow. WOW!!! 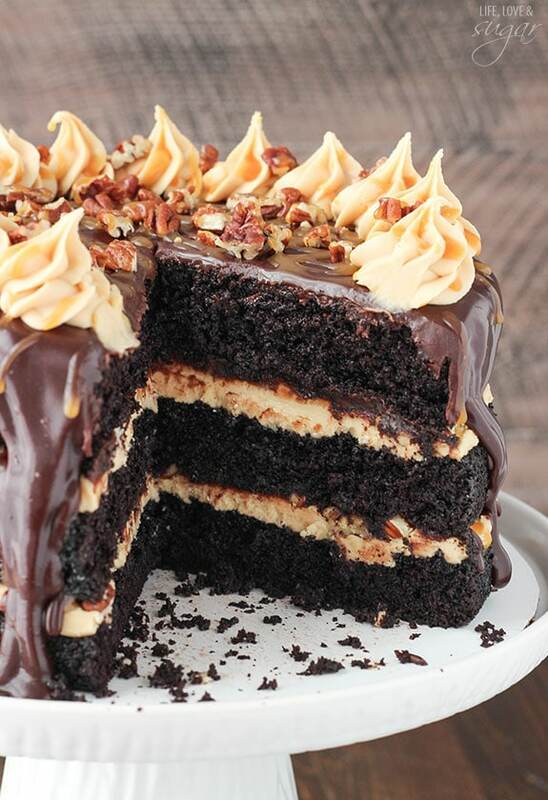 Your photos of this Turtle Chocolate Layer Cake is amazing!! Looks incredible and we MUST try this as it looks so moist. Thanks for sharing. 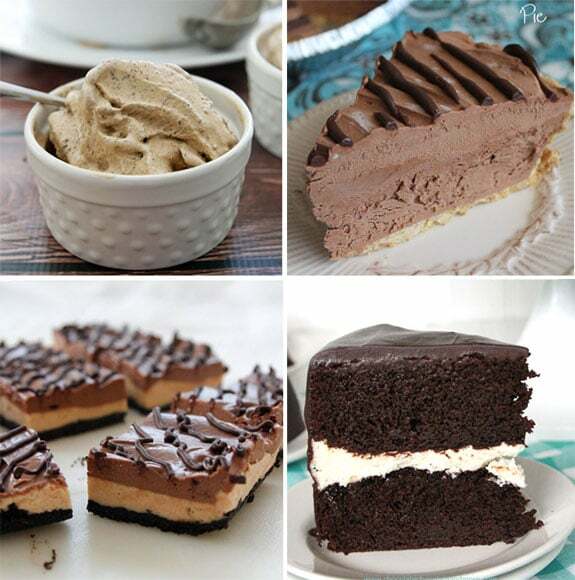 – if your icing is too thin, refrigerate it for 2 hours & then beat it with an electric mixer. That should do the trick. ???? 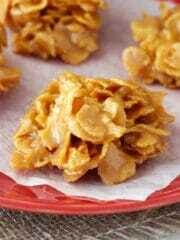 – to avoid thin icing, make sure the caramel is completely cool before adding sugar & milk. some pans lose heat faster than others. If you start with a cool caramel base, your icing will be perfect. This cake is sublime! ???????? I made this cake for Mothers Day it turned out very pretty, but I had to substitute the frosting with Carmel Butter Cream.. I am still having problems making the Carmel, but no problems making Butter Cream so I just added some store brought Carmel..
My family, and coworkers loved the cake. Thanks for sharing your recipes ..
Hai. 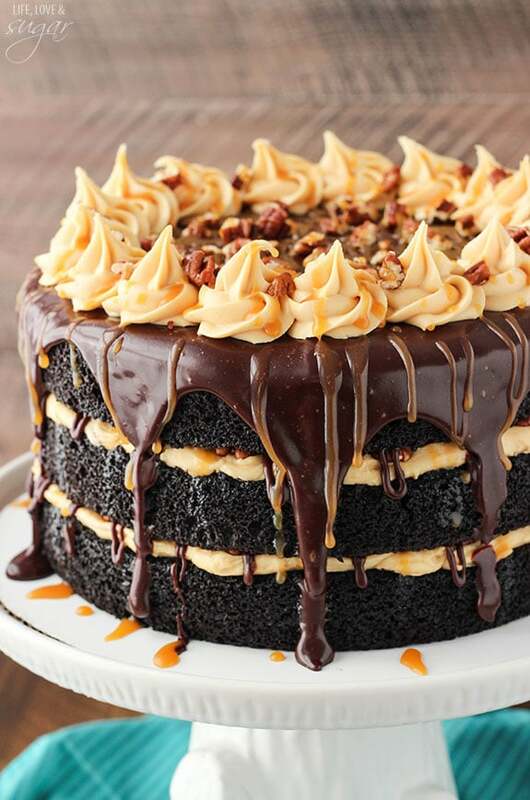 Can i pre make the caramel icing and keep it in refrigerator or room temperature will be fine? Definitely! I refrigerate it and then bring it back to room temp or heat it up a bit. How long does the caramel frosting keep? it’s one of the best frosting’s i’ve come across and constantly need it at hand. so i’m wondering how big a batch i can make and the longest i can keep it for. You should be able to freeze it for about a month. 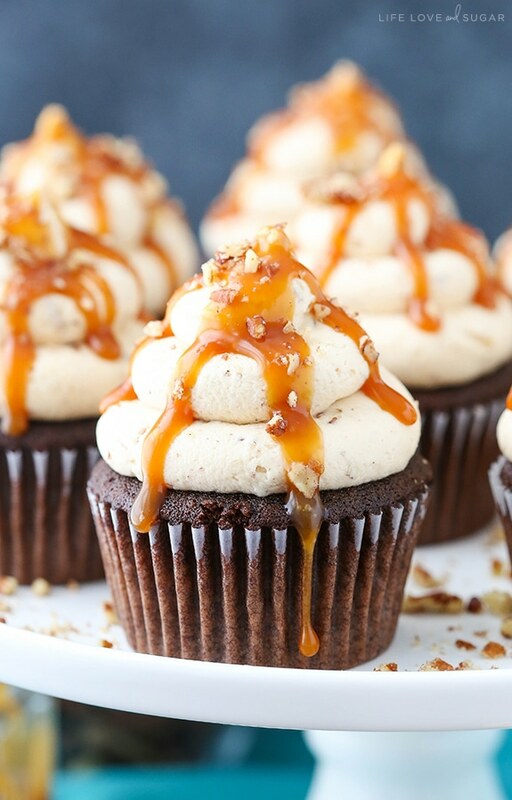 Caramel frosting was grainy as sugar dis not melt….waa not fluffy and smooth….and runny too…. I have made this cake three times already and every time, it disappears. I do have problems with the thickness of the cake layers. In your picture, they look very thick. But for some reason, mine look thin. Mine has not looked as pretty either. But, I keep getting asked to make it. Evidently it tastes better then it looks???? When I have made caramel sauce in past I used brown sugar but this just calls for sugar so does that mean regular white sugar? I just made this for my hubby’s 40th birthday! It came out very well, and our guests (as well as our own kids!) absolutely raved about it. I found your recipe by searching Pinterest for a moist layer cake. This one did not disappoint! So moist and flavorful. I love all your recipes. But this one is absolutely DIVINE!!!! I made it for my mother’s birthday and not a single crumb was left! Although it did not look as beautiful as yours. I hope you don’t mind if I share a tip that I discovered by coincidence. My icing came out runny (I guess I did not cool the caramel enough). I was about to chuck it and start over when my son started crying. I stuck the icing in the fridge and by the time I came back (an hour later) it had thickened. I whipped it in the blender and it worked. I got the perfect consistency. I’m so glad you enjoyed it! I haven’t made this cake in larger pans like that in a very long time, so I’m really not sure. You’d want to try it out. Thanks for sharing the tip that worked for you! Definitely will be making this for my son’s 11th Bday. A question for you: party is on Saturday… if I make it and assemble it on Friday to serve it on Saturday will it change in texture/ moistness ? Or do you recommend making the day of ? How soon it will be ready to serve? Regular unsweetened cocoa would be fine. So that means I need to make the cake mixture, bake first layer, then clean and bake again and again (possibly not enough mixture for 3 x 24cm layers). 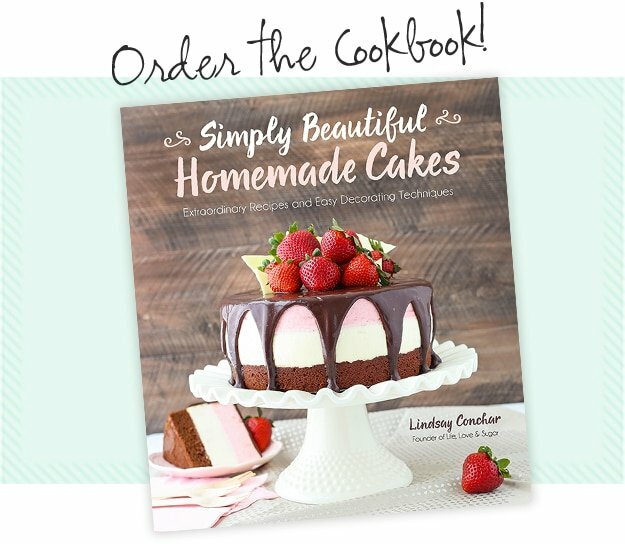 Do you have any suggestions…..
Possible bake the whole mixture in one go and slice the cake into 3 layers? or do only 2 separate individually cooked layers? I wouldn’t suggest baking one big cake. It won’t bake evenly. You’d want to do 2 separate layers at least. Also, be sure your springform pan doesn’t leak before baking these cake layers in it. The batter is very thick and will leak if it’s not leak-proof. I made this today and OH MY GOODNESS ITS DELICIOUS!! I did have some trouble with some lumps in my caramel, but that was just my own inexperience. I ended up sifting them out, then letting them harden and then sprinkling them with the pecans like toffee bits (it added a nice crunch!). Overall, it was a lot of work, but DEFINITELY worth it! I’m so glad to hear you’ve enjoyed everything! Thanks Alisha! I made the frosting three separate times…each time it was runny carmel sauce, though once it was burnt caramel sauce. I tried everything to get it to resemble icing. What a waste! I’m so frustrated. Keep in mind that as the caramel sauce cools, the frosting will thicken. If you follow the recipe as written, it will still be warm when you make the frosting. You could try letting the caramel cool completely before making the frosting so you know exactly how thick it is. Thank you for this recipe! I’ve made it twice and it turned out beautifully both times – once as a cake, and once as cupcakes. We made this but lolol it wasnt as pretty as yours. But it tastes so good and rich. I was trying to make this for my daughters graduation next month so I tried to today just to make sure it turned out right. The layers are very thin. Did I do something wrong? I’m not sure how thin very thin is, but I’d say they should be 1 to 1 1/2 inches in height. If they aren’t, then something didn’t go quite right. Are you sure you used baking SODA and not baking POWDER?